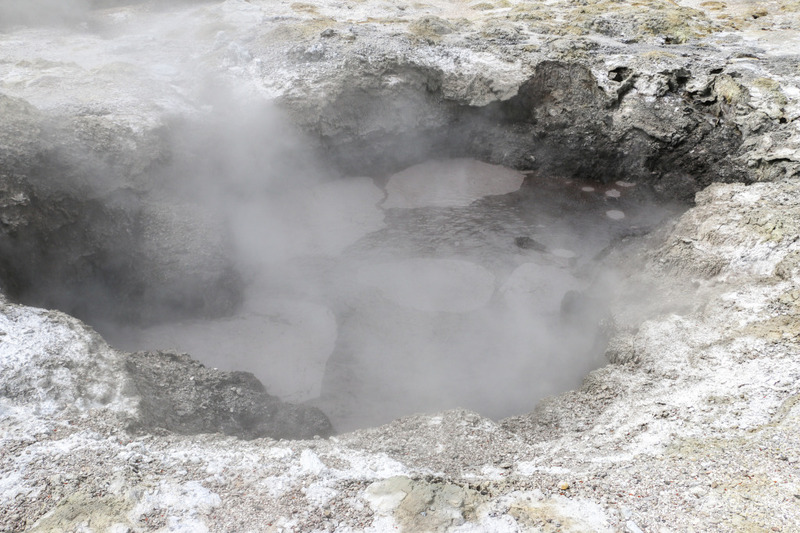 In the mood for some geothermal activity? 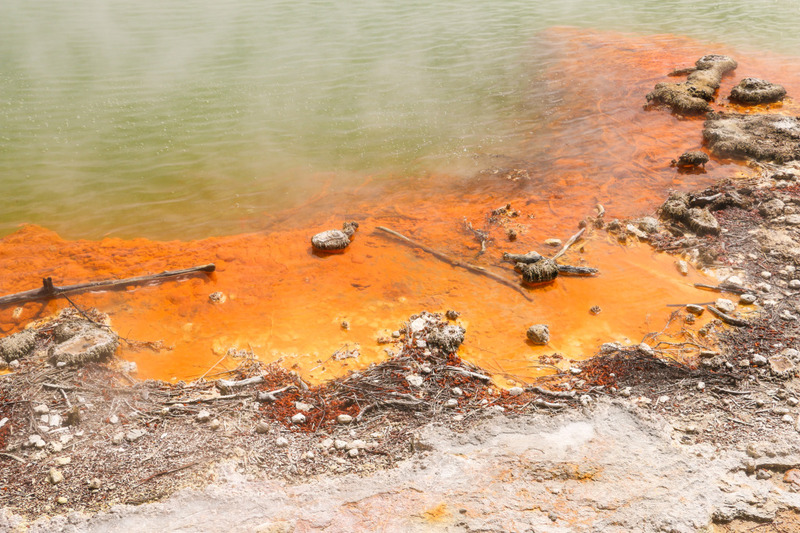 Geysers, the smell of sulphur in the air or colourful pools turn on the inner traveller in you? 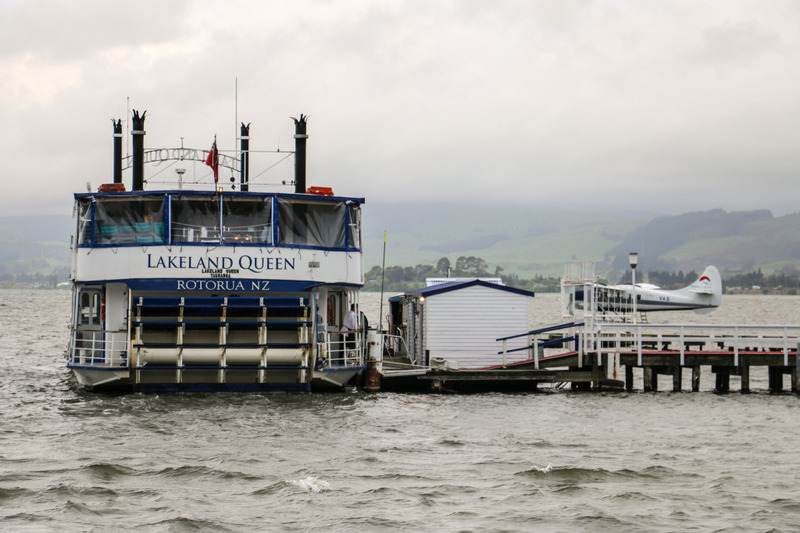 Then the region of Rotorua is the perfect place to go. 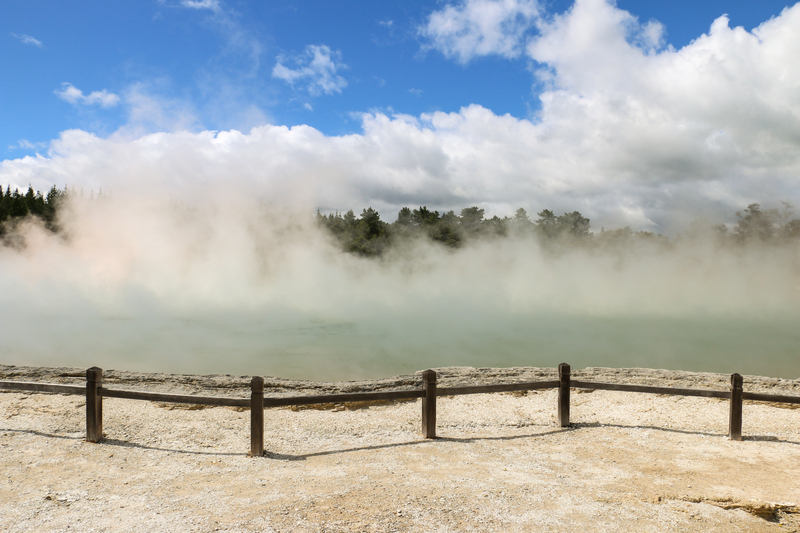 One of the most visited regions in New Zealand, Rotorua has very strong Maori heritage and geothermal activity that turn every trip to this side of the north island into guaranteed good time. 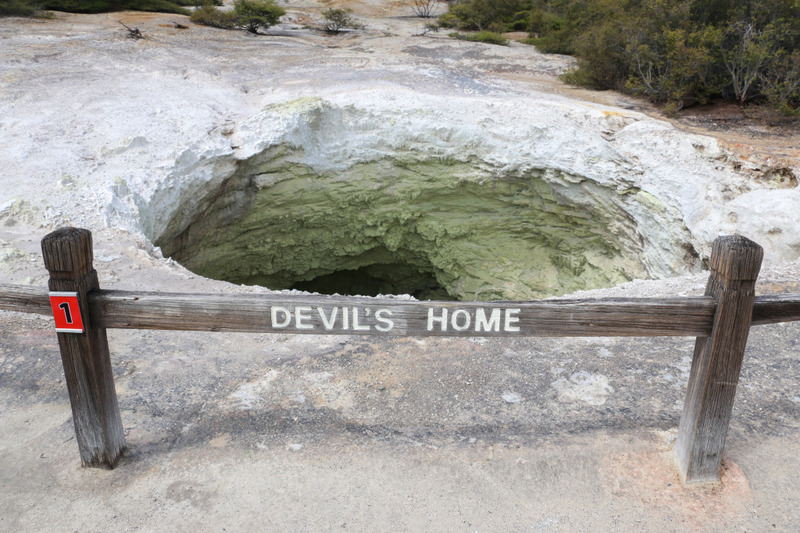 Volcanic activity shaped Rotorua region into what it is today, a hot spot with plenty of geothermal areas and lakes. If this doesn’t seduce you and you’re looking for more calm activities, then a spa is where you want to go. Hot pools at different temperatures and assorted related treatments are a must-do thing. 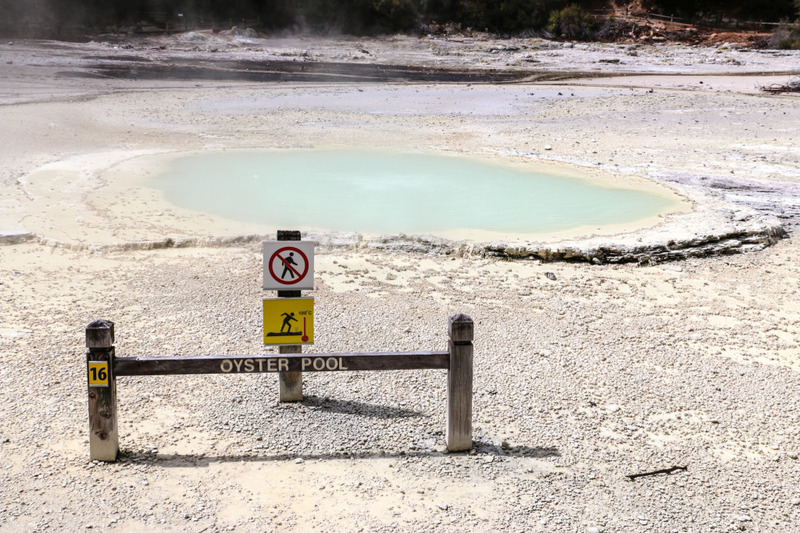 We spent over a day exploring Rotorua. A short but interesting visit. Read more to find out all about it. 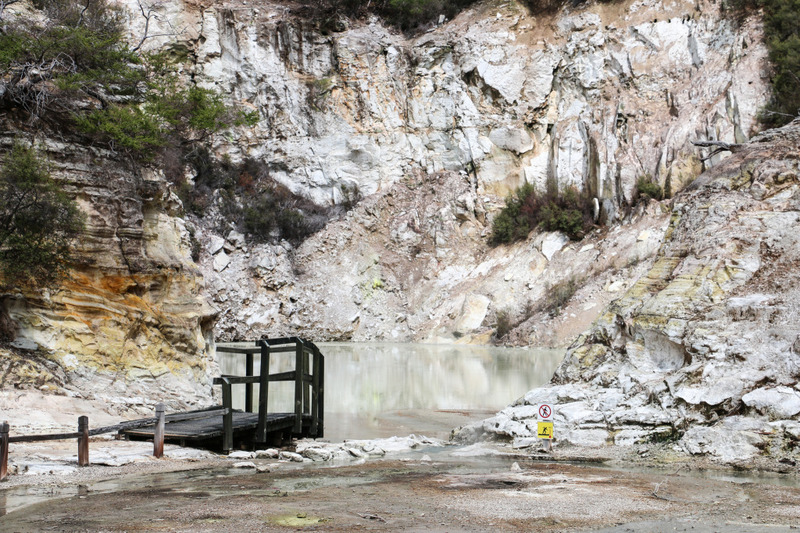 From the moment one steps a foot in Rotorua, the smell of sulphur is what will be remembered. Nothing major though, it’s just a characteristic of the place. 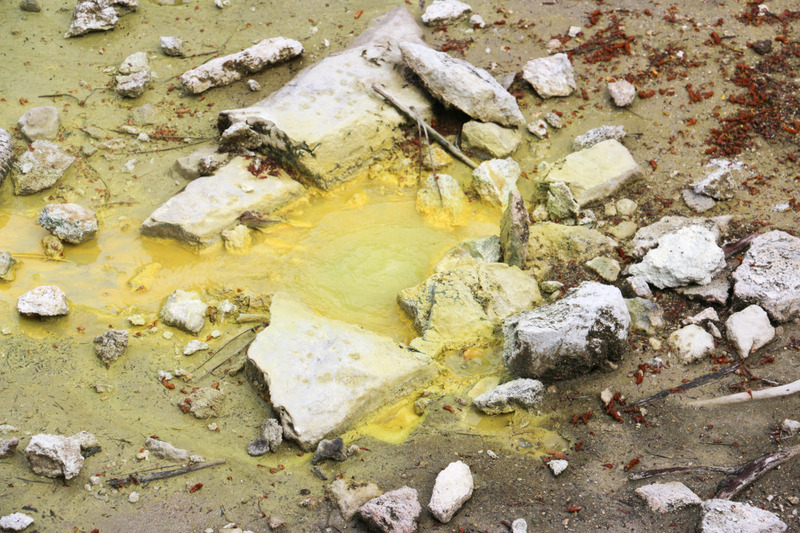 After all, Rotorua isn’t nicknamed sulphur city for no reason! 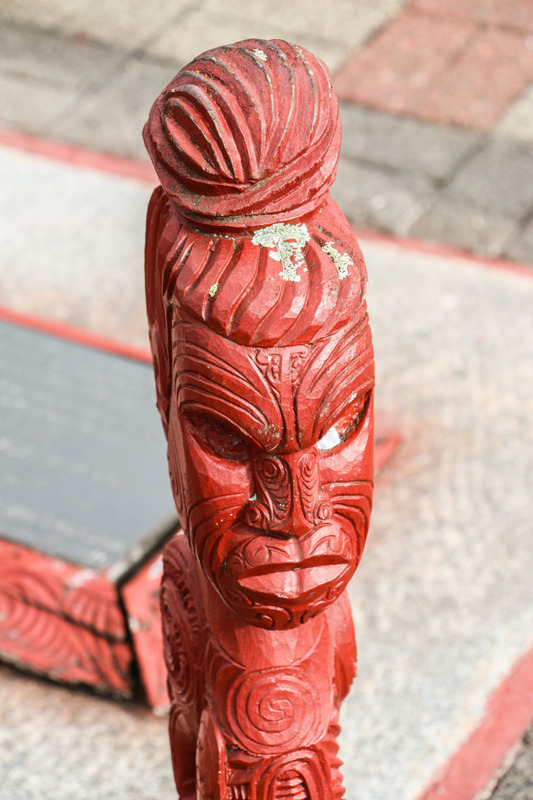 The rich Maori cultural heritage can be found throughout, sometimes in some very interesting forms and shapes. The central area is totally walkable and that’s what we did. Parked the car and roamed around for a bit. The city is very straightforward and well organized. One suggestion to start with is to get close to the main area around Fenton street, head towards the lake and then follow the lakeshore. 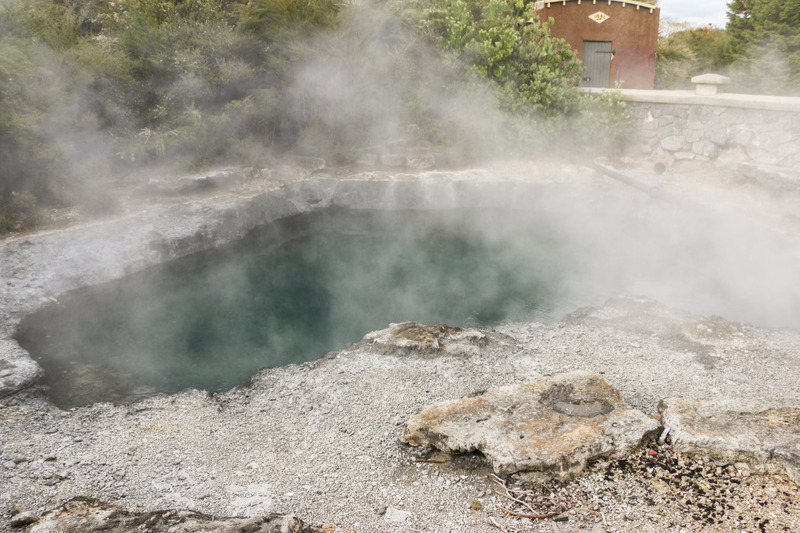 It is perfectly normal to find some small venting spots and hot pools while going around the town. 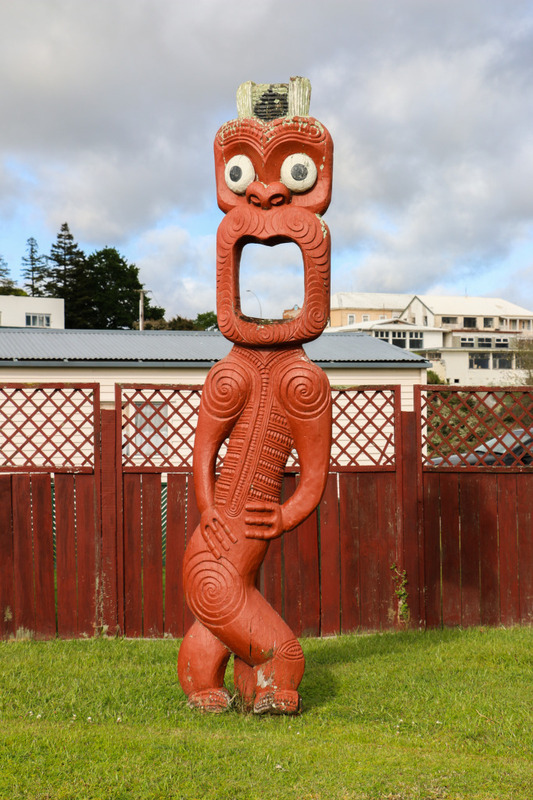 Slightly west of the center, yet still very close and within walking distance from the small pier by the lake, is a small place called Ohinemutu, with strong Maori influence. 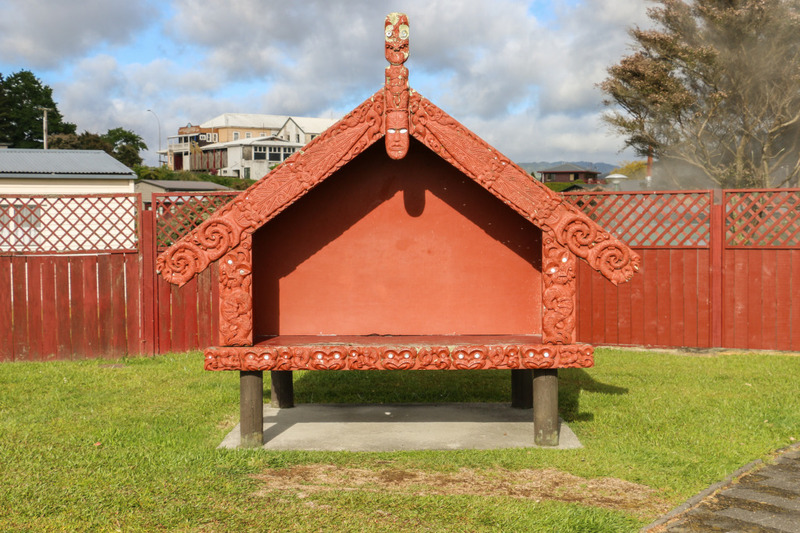 Here you can a find a peaceful Maori settlement. A few minutes are enough to visit this area. 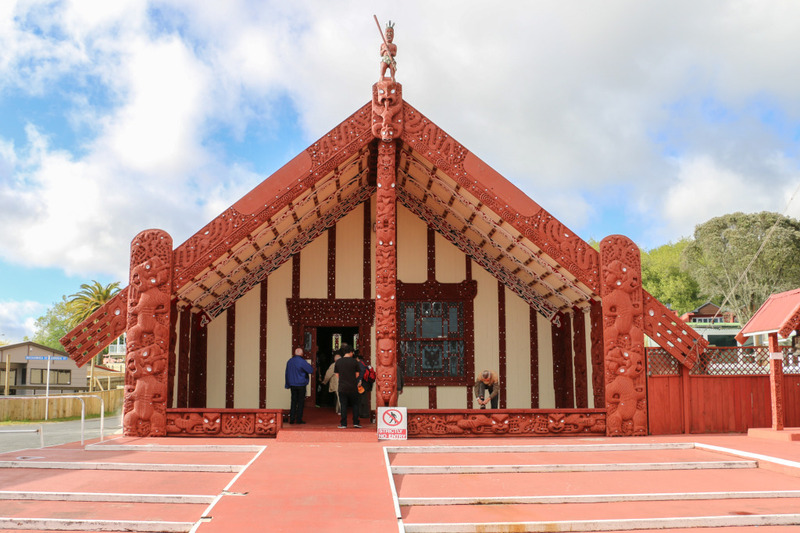 The highlight is the spectacular meeting house with the traditional Maori carvings. Also worth mentioning, the anglican church. 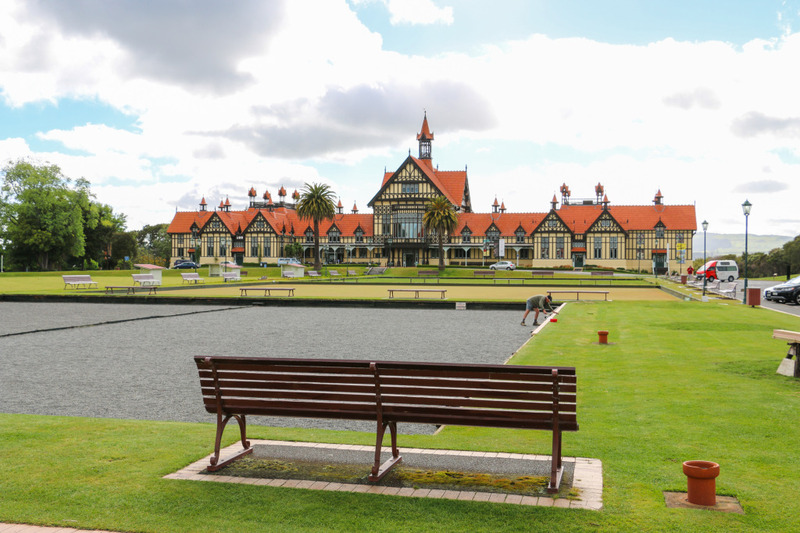 One thing we liked about Rotorua was the number of parks in a relatively small area. 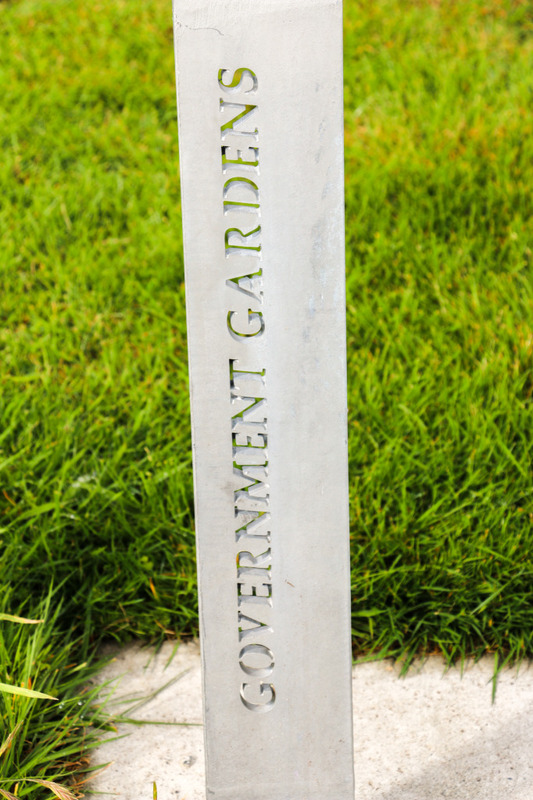 The nicest one is called Government Gardens. 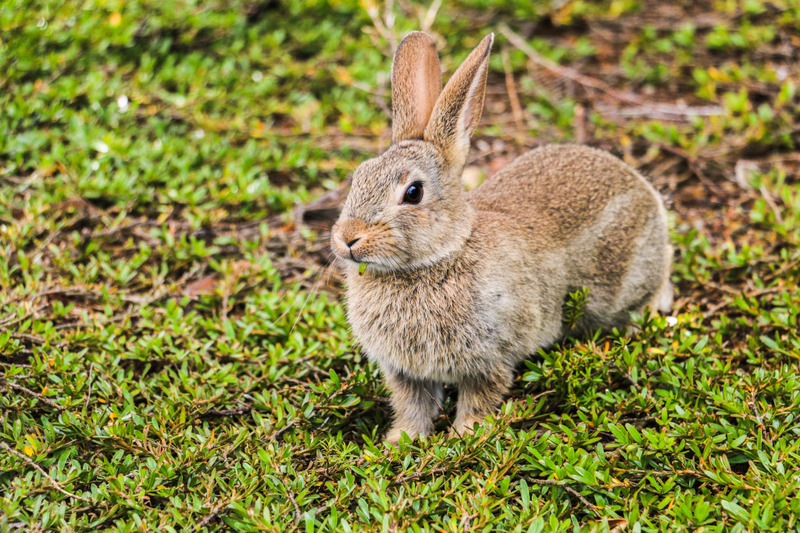 It houses a very well kept garden which includes bowling greens and rabbits to keep it trimmed (not really, we just found one going around the place eating some grass, funny though!). 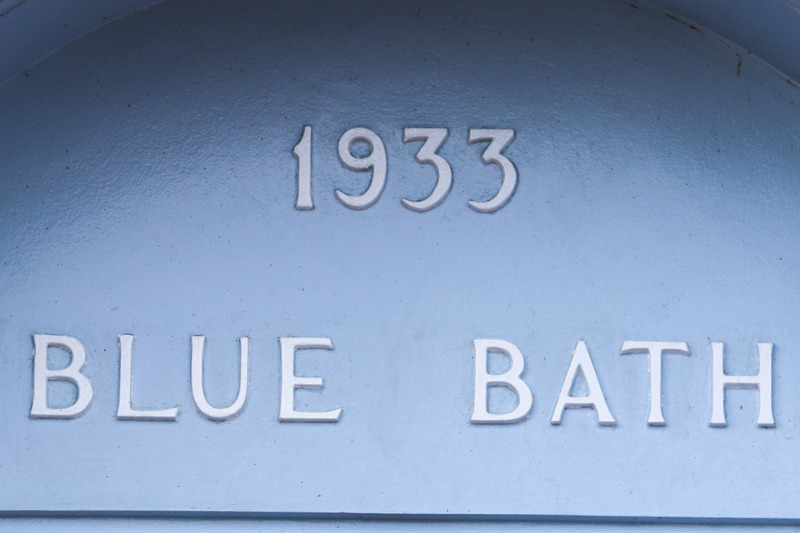 The architecture of the historical buildings, especially the Rotorua Museum and the Blue Bath, is really nice. 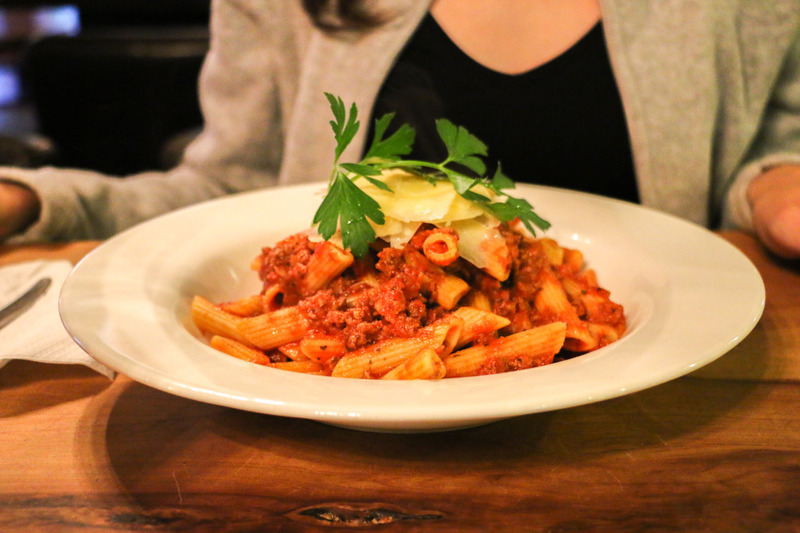 We couldn’t leave out food. 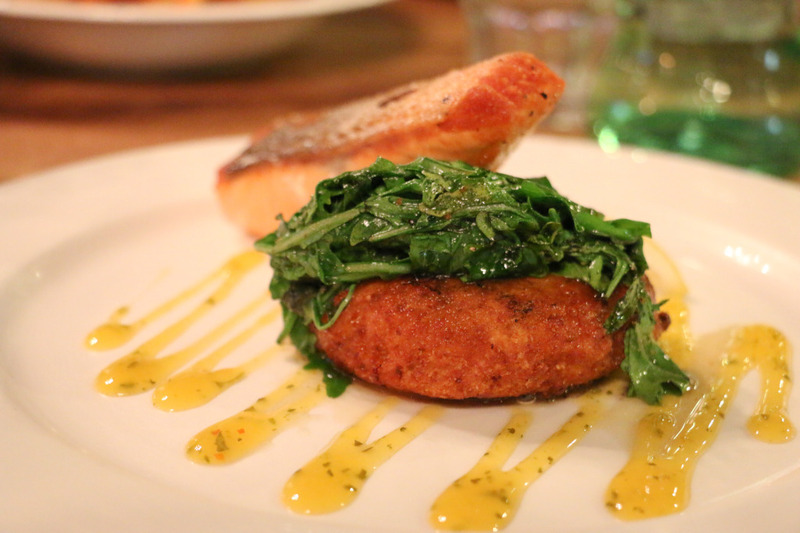 Nothing very traditional, but here’s a sample of what we had. Overall the restaurants we passed by were a bit pricey. We just decided to try out the one we found was the busiest. 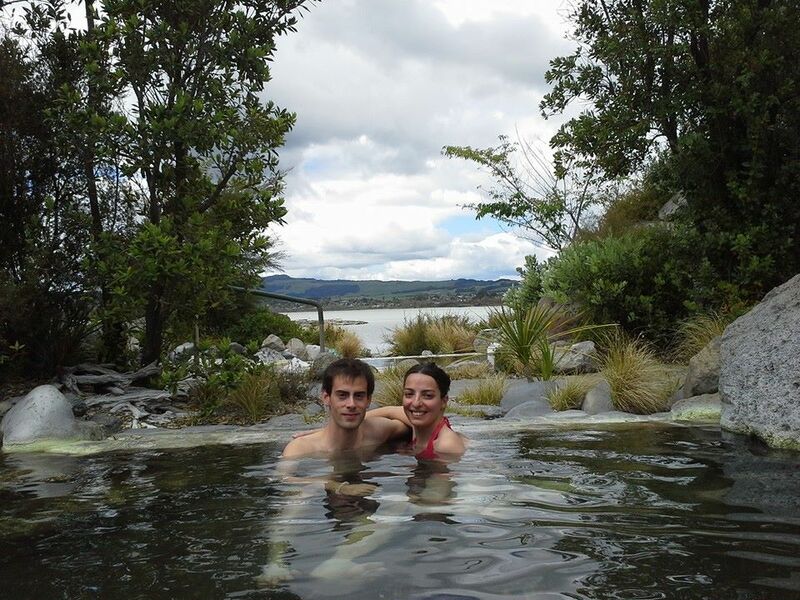 Hot pools are a major thing in New Zealand. It seems there’s one everywhere. Awesome, we’d say! While in Rotorua we went to one, Polynesian Spa, located in the center of town, nearby Government gardens. It has been named in the world’s top 10 spas and offers different pools, ranging from public to more private, plus different spa related therapies. We splurged and went for the deluxe version. This one had pools starting at 36 ºC up to 42 ºC (hot hot!) and a more private and relaxing environment with lake views. Since the camera stayed in the locker, the only picture we have is the two of us enjoying 42 ºC for a few moments, taken with one of our mobile phones. 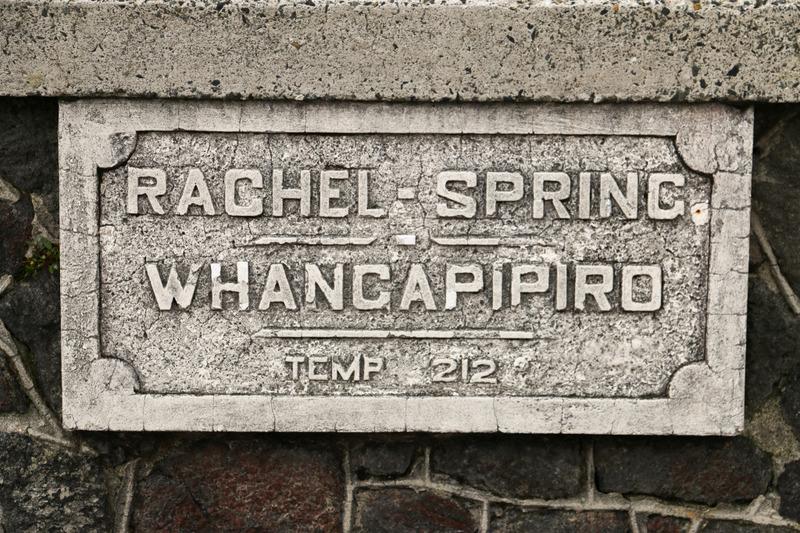 This was our first stop in a New Zealand Spa, the first of many we ended up doing. As mentioned, there are other cheaper options than this one. Definitely worth it for some well deserved relaxing time while traveling the country.. 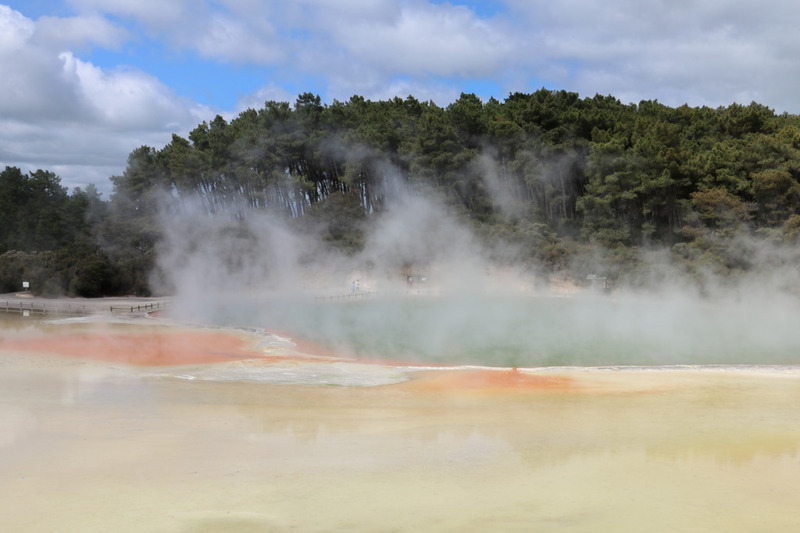 There are a few geothermal parks in and around Rotorua. 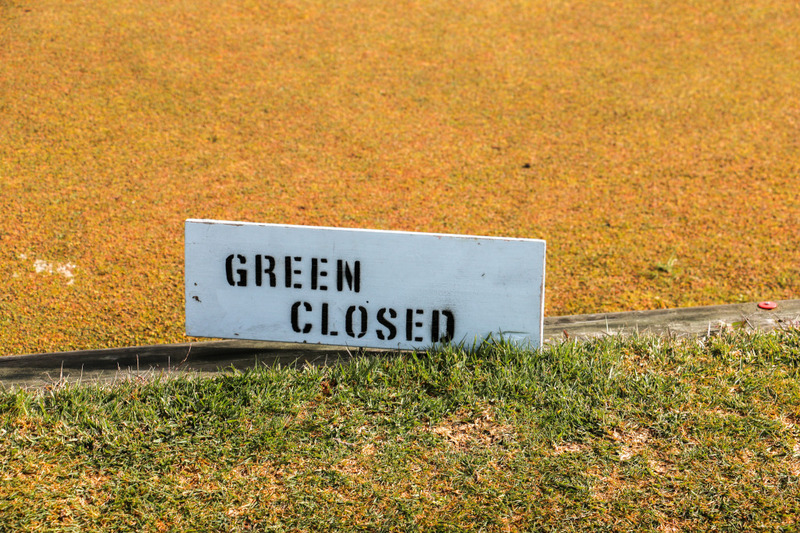 Most of them with paid entrance, at least the major ones. 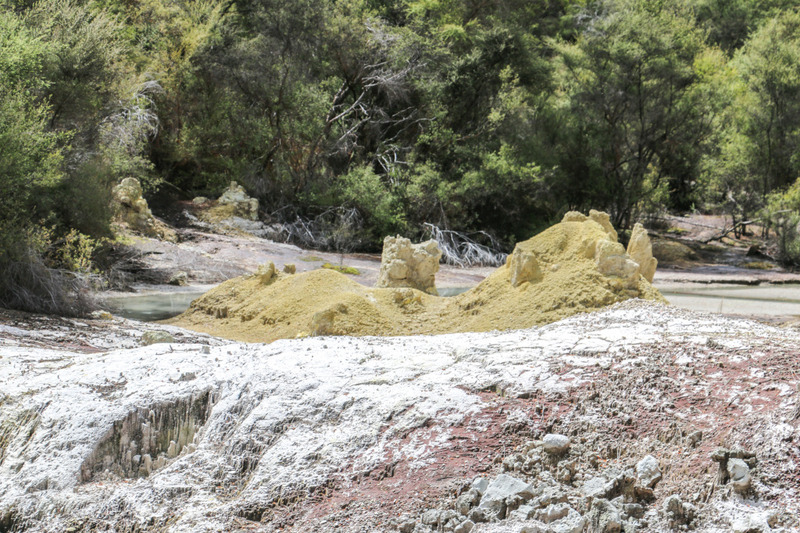 We opted to go to Wai-O-Tapu thermal wonderland. Further way from Rotorua but on our way to lake Taupo. This is a very big geothermal park with many interesting features and we spent around 3h visiting. Why 3 hours? Well, the park area is fairly big and there are different marked walking trails in place – 1, 2 and 3. We did a combination of all of them. With all the walking and time for admiring the nature and taking “some” pictures, 3 hours gone! 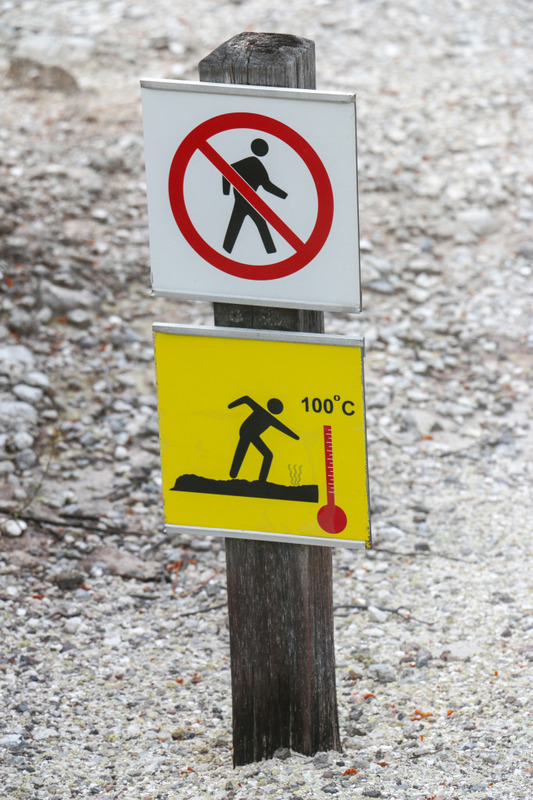 If you’re feeling less able to walk the total distance, around 3.5 km according to our gps watch, you can do only the first or first two walks. That will provide a very good overview of the area. Going back in time a bit. Our visit of Wai-O-Tapu started early in the morning. After making our way to the visitor center where the shop and ticket office are, we got back in the car and went to watch the Lady Knox geyser erupt, a five minute drive away. This is a daily event at around 10 am and the eruption is induced. 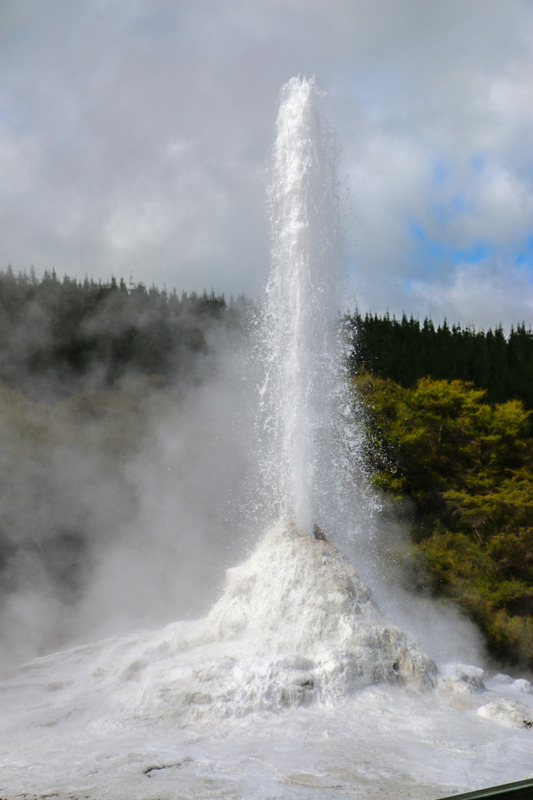 If you’ve seen proper geysers this seems very fake. Still, worth starting the visit in this area. It can get very crowded and when we visited it surely did. We’re glad we went 30 minutes earlier. Back in the main area. We were given a map with the 3 possible walks, that include the names and numbers of what to see. Very handy, because they all have very interesting names. For some reason devil had a hand in this and some of them are named after him. 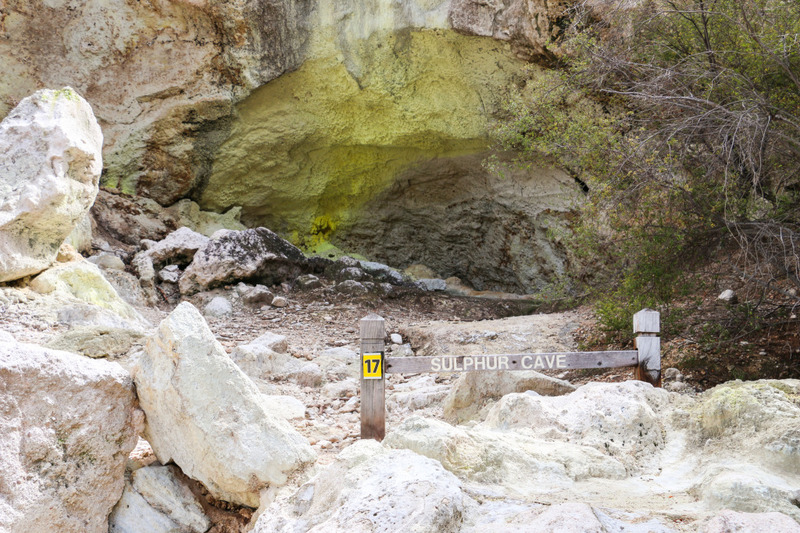 From here on, it’s all about geothermal features. 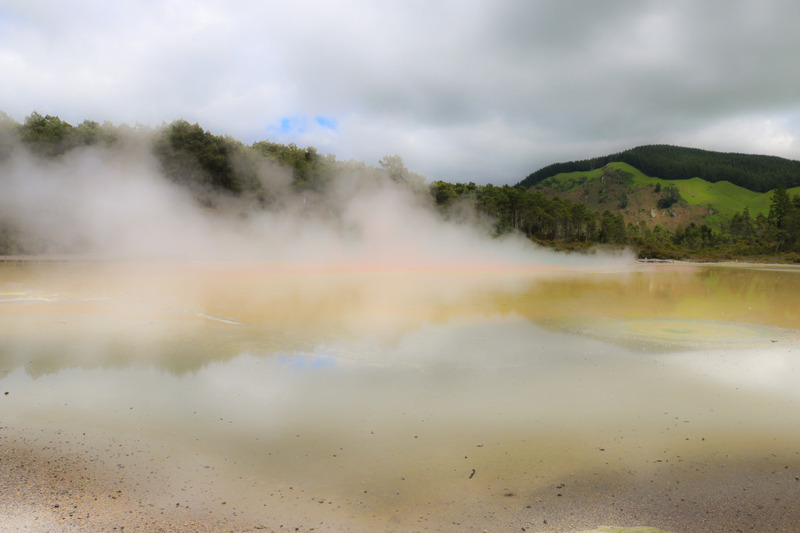 Hot and cold pools of multiple colours, bubbling mud and mineral deposits. 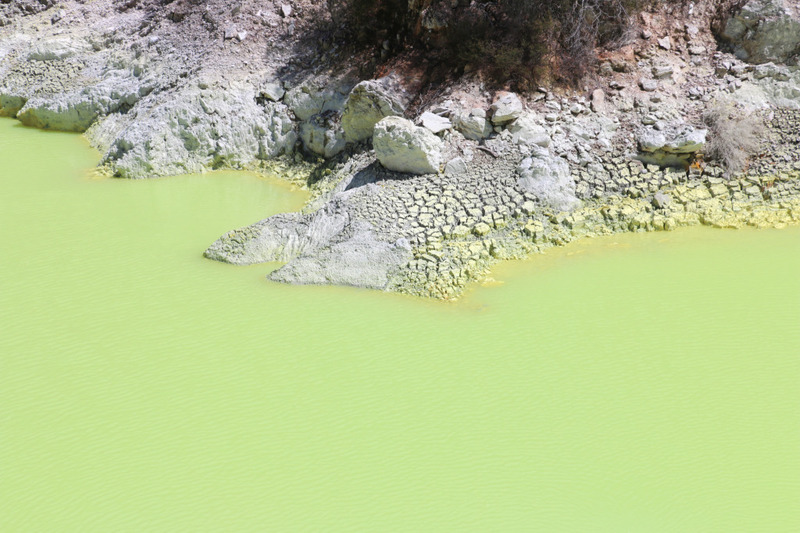 For us the most impressive one is the famous Champagne Pool, due to its mix of colours. Not that the other ones are less interesting, it’s just this one is really stunning. 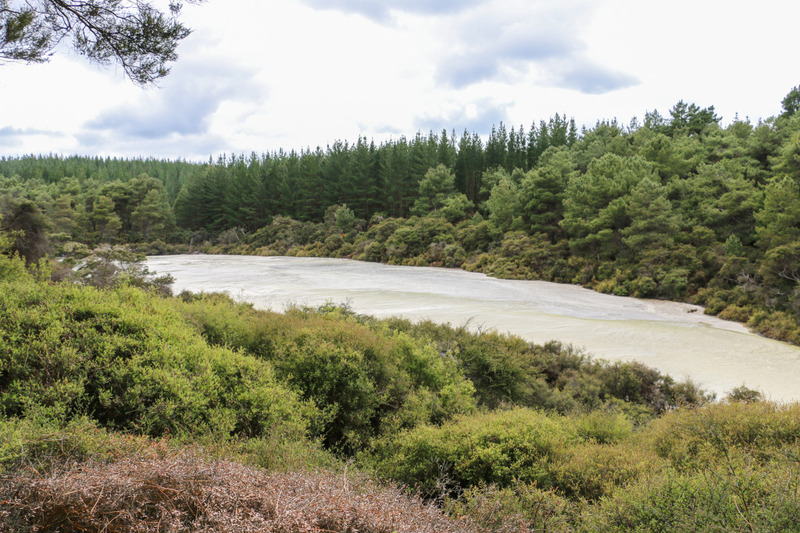 Here are some of the pictures from our walk in Wai-O-Tapu. Some practical information, including costs breakdown. We stayed in a motel. A cheaper option but with the usual good quality of kiwi motels. Entrance to the Polynesian Spa on the deluxe ticket was around 40$ each. Parking just outside the main door. More information and other prices on their page: polynesianspa.co.nz. 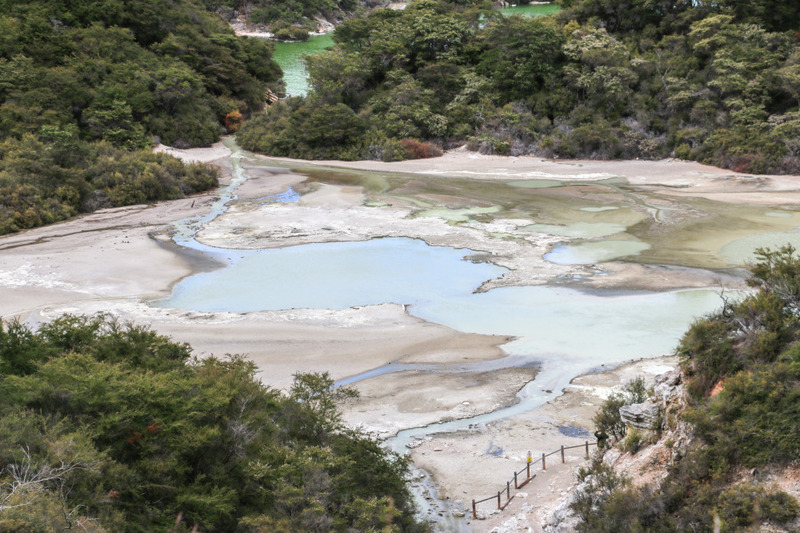 Wai-O-Tapu thermal wonderland costs 32.5$ per adult. Parking next to the visitors center, including a picnic area. 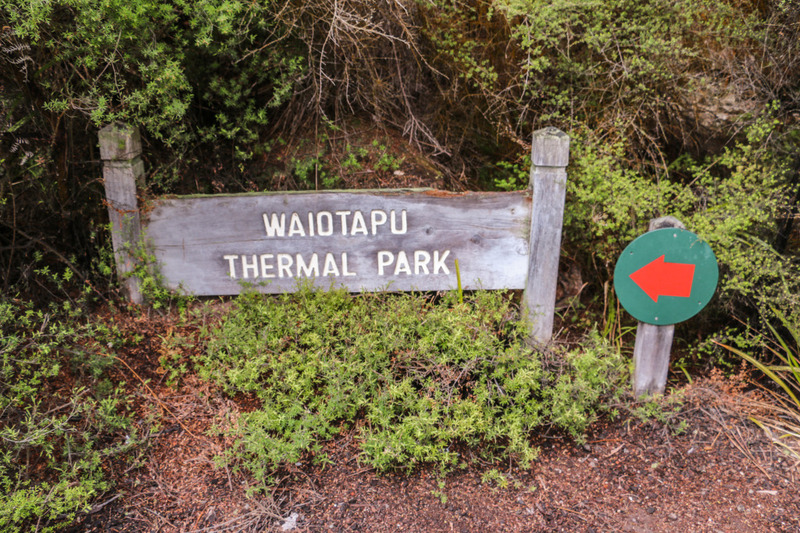 More information on their page: waiotapu.co.nz. This was during our first week in New Zealand and it was a very good introduction to some of the natural wonders of the country. 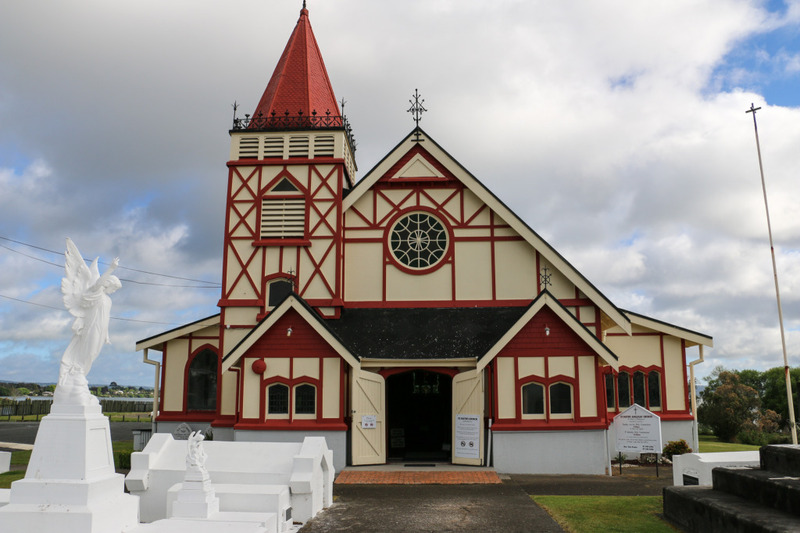 Overall the region is very interesting to visit and we definitely left out some areas worth exploring, including the many lakes, other geothermal areas and maori sites. 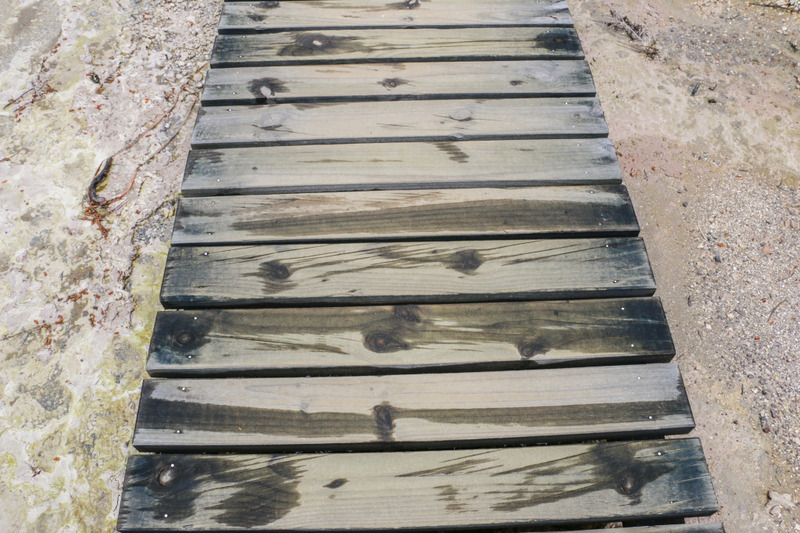 We are mentioning this because we have read other reports of some cool places to explore in the region. 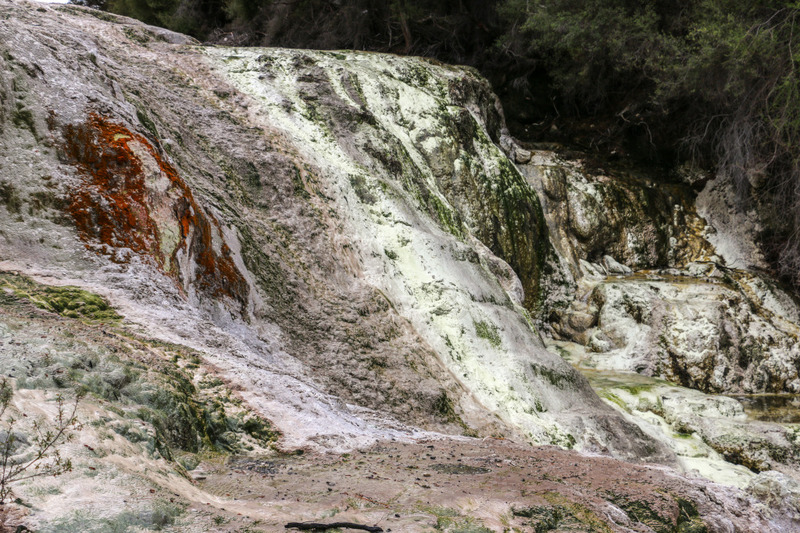 Have you been to Rotorua? How did it go? Leave us a comment! Read our other posts about New Zealand. Lovely post guys! I’m really enjoying your New Zealand section! 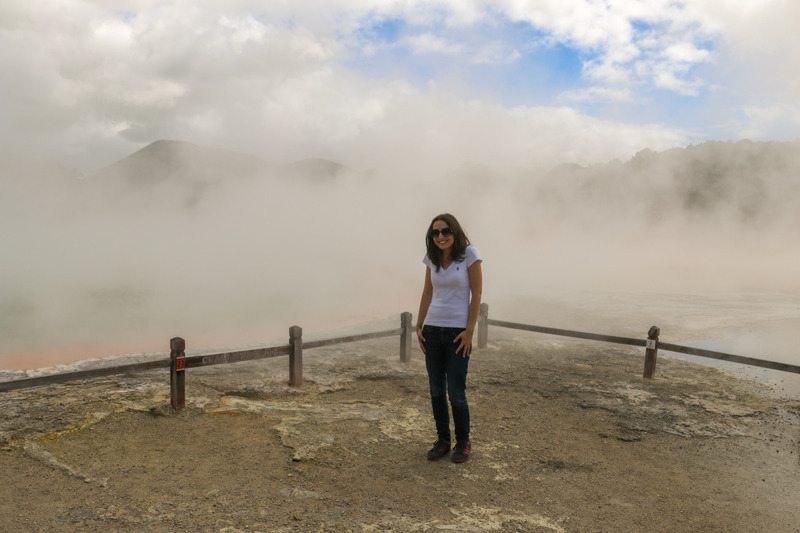 I visited Rotorua as well and I felt like I had arrived on an alien planet the moment I arrived! 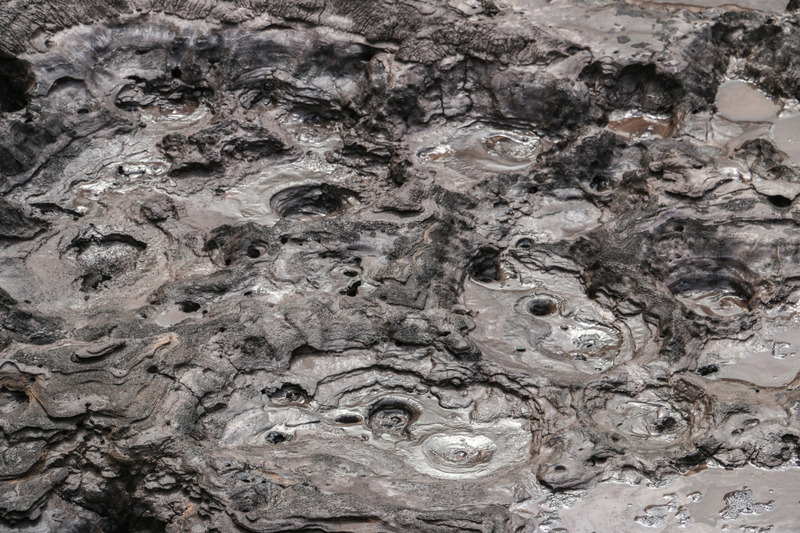 The bubbling mud pools and the rushing geysers and steam vents seemed otherworldly. I was also fascinated by the historical side of things in this incredible city! What about the lovely smell? 🙂 The area is lovely and we left a few things out because we didn’t have enough time. Thanks for sharing about this beautiful place. Have a great time, enjoy youselves.